I was never sure how my sister decided she liked turtles. One day I noticed that on a shelf in her childhood bedroom, a collection of folk-art turtle knick knacks had taken shape. Now residing in a tiny city apartment, Leslie no longer collects turtle tchotchkes. Her shelf-space is precious and limited. Here then, are turtles that can be safely added to her two-dimensional collection. While visiting the Asian exhibit area at Zoo Miami, I saw soft-shelled turtles for my first time. They have a different appearance from the hard-shelled New England turtles of our childhood. The creature pictured below was swimming briskly in an eye-level aquatic glass enclosure. As you can see by my focus, the facial features captivated me. 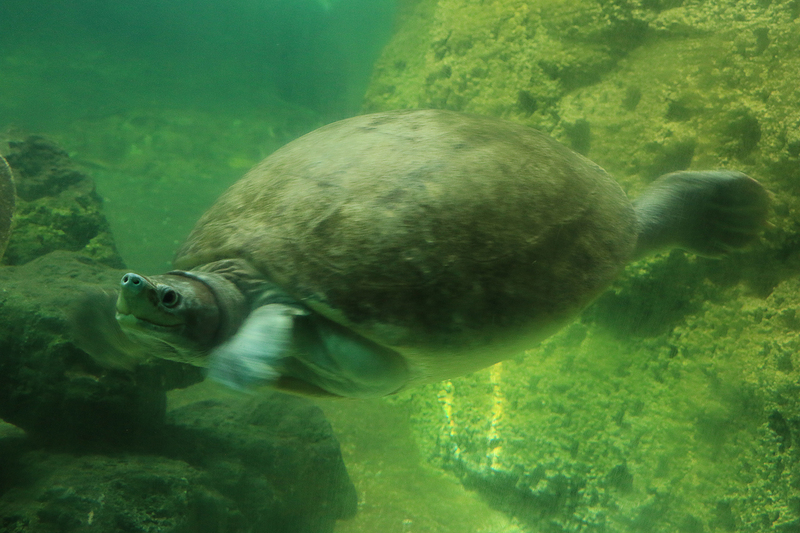 Soft-shelled turtles have snorkel-like snouts. This one seemed also to have an upturned smile-like mouth. My second encounter with soft-shelled turtles was in the “wild” of the still water lakes at the Fairchild Tropical Botanic Garden in Coral Gables; Miami. 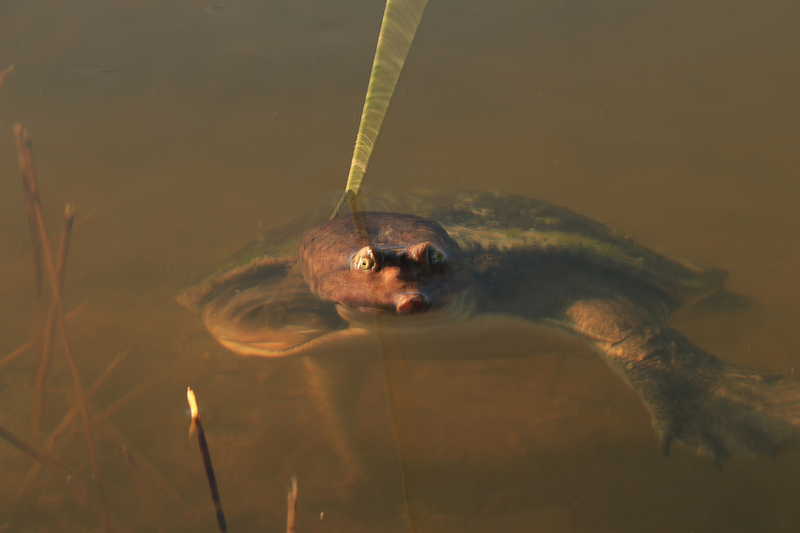 A handful of these turtles were swimming among water lilies, reeds and decaying flotsam of plant matter. The curious turtle in the photograph below seemed keen to observe me closely while I was photographing on the banks of Royal Palm Lake. It was holding still, though floating. When it lifted its head out of the water it anchored against a water reed, which bent or straitened to produce some motion blur. The water seemed to coat the raised eyes as the setting afternoon sun shone on them brightly. Fairchild Tropical Botanic Garden | Apalone ferox – Soft Shelled Turtle. Native to Southeastern United States, Florida soft shelled turtles are carnivorous, aquatic creatures that prefer still waters of ponds, streams and lakes. Adults can reach lengths of up to 29 inches, and weights of 44 lbs. They have long necks, elongated heads and snorkel-like snouts. Many, many thanks for the pat on the back.